I like all the work and thought you have put into this! I created a couple of boards to be set up more like regular chess. Both boards are set up with a row of pawns in front; the king, queen, bishops, knights, and castles/rooks from each side mirror each other; and castling functions in both directions. Both have an extra bishop so that there is one on each color. The first board's ends bow towards each other while the middle parts are futhest away, and the wide spread causes extra pawns (11 total) to be required to keep the rooks from being able to automatically get out. It also has the effect of allowing the bishops to all be able to line up against opposing bishops or a rook immediately after blocking pawns are moved. The second board also has a row of pawns in front, but it is straight across, and this ends up leaving one blank spot that only the king or a knight could move into. The bishops are more centrally located so, like your original, none of them or the queen diagonlly line up with any opposing pieces. Also, the rooks are much more hampered in moving "sideways" than in the first board, which more closely reflects regular chess. I have attached a picture of the boards. I am interested to hear what you think! Hi Carlos Your variant is interesting, especially in that there is an extra queen per side, which is an extra sweetener for a hexagonal game, as far as tactical players would be concerned, I'd think. It's nice any pawn can make an initial double step without instantly depriving the opponent's pawn on the same file of an initial double step with such a move. I don't know if castling would often be especially beneficial in such a hexagonal variant (presumably it's not always a poor idea), but at least that rule emulates the one in chess, if that's a positive thing (it might be in the eyes of at least some chess players). Hypothetically, what might make for a more (at times) strategic-maneuvering hexagonal variant than those I've looked at would be using McCooey's pawn capture rules (as your variant does), and the sort of almost boardwide setup for pawns as in either Glinski's variant or yours, except to try to find a way to add 2 extra pawns per side to the 2 remaining pawnless files in the start position (i.e. on the 'a' and 'k' files, presumably on each side's rearmost hexes on those files). Otherwise, I would suppose those 2 extra pawnless outer files might nearly always eventually make for a considerably less blocked (or duller) struggle in the middlegame or opening than can arise at times (and go on for many, many moves) in chess middlegames or openings, if only because major pieces (particularly rooks) might tend to be traded on the open files in such hexagonal variants, at least in games between evenly matched players. Adding 2 extra outside file pawns would seem a more natural modification with your variant than Glinski's. Doing so for either game might result in a start position that's not so pretty in either case, however. That's especially since the extra outside file pawns could well be unprotected to start with. There would not be this drawback if Glinski's pawn capture rules were used instead, but then there would be no blocked pawn chains possible as in chess, as previously mentioned, and I'd think that wouldn't be helpful for stategic manuevering. Nevertheless, note that in such tri-coloured hexagonal variants, diagonal-moving pieces can get through a mutual pawn chain situation, if they can move on the third colour the mutual chain situation does not affect, something that does not happen in chess. Still hypothetically, in the case of your variant's start position, having all of each side's rearmost pawns (i.e. those on red hexes in your diagram) 1 hex forward on their respective files would allow the rooks to guard such additional 'a' and 'k' pawns, satisfying my desire of having them protected at the start, and such a start position might not be so ugly. I need to note that, in this hypothetical setup, even though I think I might not mind allowing an initial double-step by any pawn, I suppose there would be pros & cons whatever the initial pawn step rule(s) might be. I kind of like having the bishops start on 3 different colour hexes, as in Glinski's or McCooey's variants, but perhaps one can't always have everything one wishes for. 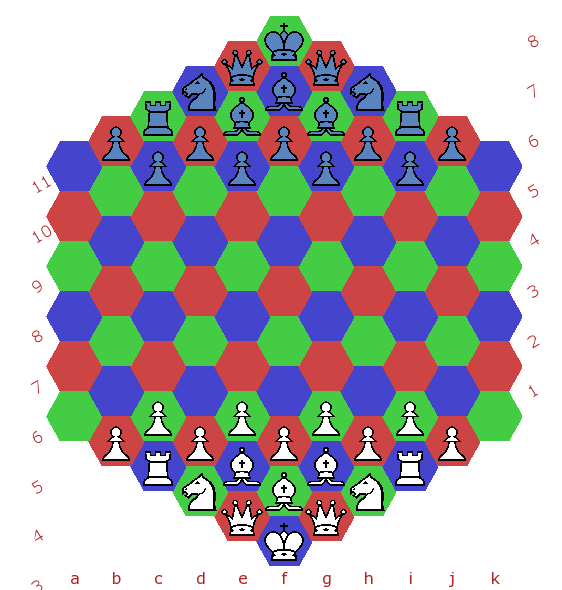 If I get very keen on the idea of hexagonal variant(s) again, I may want to think about how to arrange that for the 3 bishops, which could include my adding in some extra (perhaps even fairy) chess pieces to help fill in the resulting empty hexes in each player's camp in the tentative hypothetical start position. This could also help make for a more strategic-manuevering game at times, with more existing pieces in search of thus more scarce good/adequate hexes in the opening/middlegame - in fact there would then be less than 50% of the cells empty (39/91) at the start, less than in chess. Alternatively, I might go back to using just 1 queen to make more room/symmetry (if necessary) for 3 different coloured bishops, if I still prefer having the latter. Still, I haven't by any means researched all known hexagonal variants, and someone may have already thought of all these considerations & more. Could it fit, satisfy the lovers of strategic maneuvering taste? Answer to Charles Gilman: Yes, me, I tried. See Echexs for 3, or 6, players with McCooey's arrangement. I think Glinski chose his pawn movements such that pawn chains would more closely resemble Fide Chess pawn chains. I chose the same movement for that reason in my Hexagonal Hole Chess. In the rules for that game I discuss both types of Hexagonal Pawn movements. Jonathan's logic also seems very probable. I only have a theory, but I think I know the reason why Glinski had his form of pawn capture. I suspect it was to avoid getting pawns close the the far rank too quickly. In regular chess, a pawn capture only advances the pawn one step closer to promotion, just as a regular pawn step would have. In Glinski's version, a capture only advances a pawn one step closer as well, while in McCooey's, it actually advances the pawn the equivelant of two spaces closer than it already was. Does that make sense? Glisnki was better emulating the difficulty of pawn promotion, while McCooey was better emulating the movement. I guess it just depends on your preference in that case. I've never understood Glinski's pawn taking manoeuvre. Dave McCooey's version makes much more sense. Great article! From one McCooey to another,this looks excellent.Can't wait to find the time to tyr it! My kids and I made a hex chess board and we found this to be a lot of fun! The game is quite faithful to conventional chess and the moves were similar enough that my five-year-old son learned them on his own, just from studying this site; thanks for the great diagrams.